Sea otters may spend a lot of time floating on their backs, but they're no layabouts. These sleek sea creatures, related to the weasel, are adept swimmers that can spend generous about of time hunting prey underwater. Unlike their river otter relatives, they aren't nearly as successful moving on land, and thus spend most of their time in the water. With their exceptional swimming and uniquely insulating fur coats, sea otters inhabit an area that stretches from the southern California coast to Alaska and beyond. A sea otter's preferred method of moving about is on his back, floating on the surface and moving not particularly fast. Swimming on his back, a sea otter moves at a speed of about 2 mph, paddling with his back feet and tails. A sea otter can sleep floating on its back, though it takes special precautions to prevent himself from accidentally floating out to sea -- he anchors himself in place by wrapping himself in kelp before they nod off. Sea otters can move faster when they need to, whether they are hunting or escaping predators. 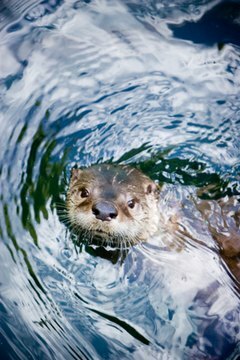 Swimming underwater, sea otters can swim at speeds exceeding 5 mph. They do this by taking advantage of the shape and musculature of their bodies, which allows them to undulate up and down and aerodynamically cut through the water. When the sea otter swims like this, he uses his webbed back feet like rudders that steer him through the water. Sea otters have big appetites. They spend much of their time foraging for food such as urchins under the water. Unlike river otters, which can hold their breath for well over five minutes, sea otters tend to dive for two minutes or less. Since they are coastal animals, they don't generally have the opportunity or need to stay underwater longer than this -- the deepest dive ever recorded for a sea otter was less than 350 feet. Sea otters don't spend much time out of the water, because their bodies simply aren't designed for land travel. When you see footage of an otter moving quickly and gracefully across land, you're seeing a river otter. Sea otters generally lack grace and confidence when navigating dry land, and therefore prefer to stay in the water, where their bodies can move fluidly.